In Grade 5, the children’s study of Hebrew and prayer expands as they learn the Avot v’Imahot, Shalom Rav, Oseh Shalom, Lecha Dodi, V’shamru and Shalom Aleichem. Students have ample opportunity to practice their Hebrew reading this year to strengthen their skills as they prepare for their b’nei mitzvah. We also study the Jewish life cycle from birth through death and the many Jewish customs associated with life events. 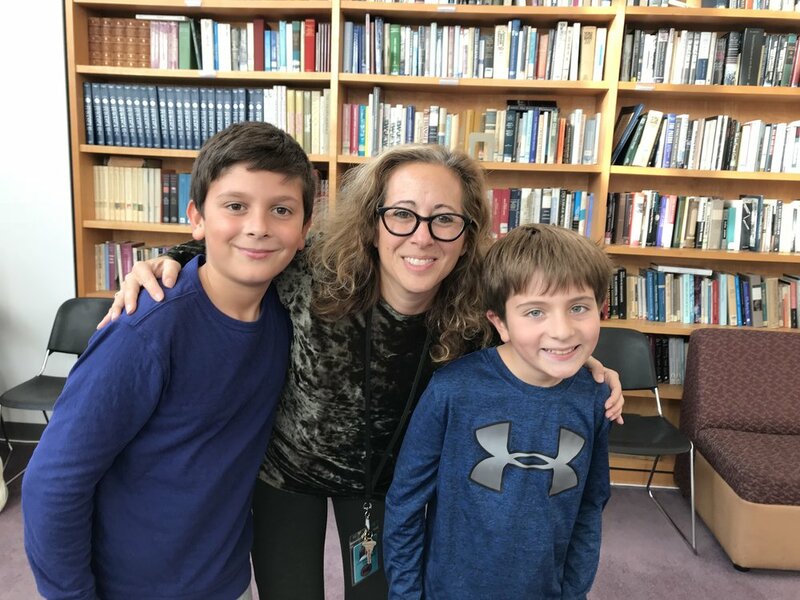 In addition, we learn about and actively participate in the mitzvah of tzedakah, and collect tzedakah every week for an organization of the class’ choosing. We also study the State of Israel—its creation in the wake of the Holocaust, its people, cities, religions, government, politics, foods, and culture—and the students do individual research and presentations on the leaders of Israel, from Theodor Herzl to the present. Our holiday curriculum consists of activities exploring the theme of each festival, and for Purim, the grade enjoys the privilege and responsibility of creating and running our Temple-wide annual Purim Carnival. Student Shofar Sounders for Grades 3 – 6. Learn + rehearse with Cantor Robin, and blow your very own shofar during our Family Services on Rosh Hashanah + Yom Kippur. Please note that on Sunday mornings, we begin with Assembly in the Sanctuary. We encourage all families to join us for their children’s Assembly. Dismissal for Grades K+1, parents will pick up their children directly from the classroom. Students in Grades 2+3 will be dismissed to the parking lot. Grades 4-6 will end the day with Assembly, starting at 12:40 pm. We encourage all families to join us. 6:30 pm with family, classmates, and teachers. Then, at 7:30 pm, we welcome the entire congregation to our lively Family Shabbat Service, in which your child’s grade will participate. Families with students in all grades are encouraged to attend all our monthly Family Services. As always, the entire congregation is encouraged to sign up to contribute food each month. We are also looking for Religious School Class Parents in all grades. We appreciate your input and invite you to share talents, interests, hobbies, and professions. We also need your help with Tzedakah project.